In the far off past when I was a professional programmer writing software for money I relied on a variety of tools to fix the inevitable errors in my work. These tools would look at my thousands of lines of code and check that I had all my brackets and semi-colons in the right place and that I hadn’t mis-spelled the names of variables or functions. I also relied on more serious debugging software, programs like ‘dbx’ that could investigate the inner workings of other programs, monitoring them as they ran and giving me complete access to the instructions I was executing and the data structures they were manipulating. Journalism’s frayed relationship with advertisers – The Boston Globe – “If there is a market failure to provide an adequate supply of journalism, there can’t be a public remedy for it. If one were proposed, Amy Goodman and Rush Limbaugh would have to link arms to block it. For it would mean government control of journalism. Sometimes it is only when the niggling pain goes away that you realise just how irritating and distracting it had become. A sore tooth can sit for weeks just beneath the threshold of consciousness before you finally decide to do something about it, and you leave the dentist full of optimism, hope and love for all humanity now that you can think clearly. Well, like a man who bangs his head against a brick wall because ‘it feels so good when I stop’, I’ve finally given up grubbing around for open wireless connectivity on the move and invested in a 3G modem for my laptop. One of the more interesting announcements made at last week’s Consumer Electronics Show in Las Vegas was that BT Vision, the on-demand TV-over-broadband service, will be available on the Xbox 360 later this year. It was one of several media-related announcements from Microsoft, including deals with both MGM and Disney-ABC that will see Rocky, High School Musical, Lost and many other films and TV series available to download on Xbox Live. BT plans to use the Xbox 360 as a set top box rather than simply joining Xbox Live, so you’ll only be able to get the service if you have BT broadband at home. Guy Fawkes’ blog – Ten years ago Matt Drudge broke the Lewinsky story.. 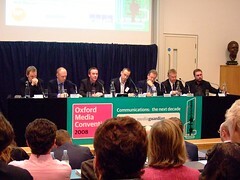 The final panel at today’s Oxford Media Convention. 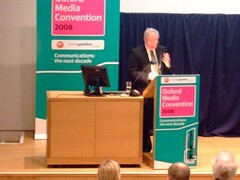 And also on The Guardian, BBC and Press Association. Clarkson’s ‘steal my ID’ stunt backfires | The Register – You could almost feel sorry for him. Almost. The coming year is not going to be a comfortable one for Facebook. It might just manage to avoid upsetting its users with new services like Beacon, the misjudged advertising feature that told your friends about your purchases. It might spot fake profiles of famous people, like the two Bilawal Bhutto entries that fooled both Facebook and some newspapers, and remove them before they get noticed. And it could even avoid falling victim to one of the frauds that are likely to be perpetrated against users of all social network sites, outlined in Mark Ward’s review of the biggest security risks of 2008. But even if Facebook is lucky it will still get a lot of coverage.